The preliminary results are in from our Design Survey. We want to thank everyone who participated. We appreciate you taking the time to share your opinions and comments. Almost 600 people ranked and commented on our proposed designs, with over 1,800 comments. This was a very, very helpful process to help us determine how to proceed with the design from here. 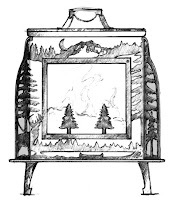 Our Ideal Steel Hybrid was our first stove to offer personalization. We plan to offer personalization with our Absolute Steel Hybrid as well by providing different versions of the same firebox with very different design treatments on the outside, along with different leg heights and overall geometry. The three most popular designs in our initial survey were the “Au Naturel,” the “Cottage,” and the “Prairie,” in that order. Between the three, the rankings were very close. The Au Naturel had the greatest number of positives, but the Cottage and the Prairie were not far behind. We were surprised (and pleased) that the Au Naturel was the most popular. It is quite a departure from our normal stove designs, but we like to try new things, so we are excited that this one was a hit! Wings: The wings aren’t very big (about 4.5” on each side, and they help to frame the window and give some space for decoration). A lot of people loved the wings, but others not so much. We’ll work up a couple “wing-less” versions over the next few months for those who want K.I.S.S. (Keep It Simple…) stoves. Symmetry/Asymmetry: the design on the Prairie is very symmetrical; Au Naturel is asymmetric, and the Cottage is in the middle. We’re glad we did all three, because there were marked preferences toward one extreme or the other. “Very pretty, also good in a cabin or lake house”. “This is my favorite. Really like the way the tree over lays the fire. Very cool”. “A rendering of a bucolic scene that is restful and appealing”. 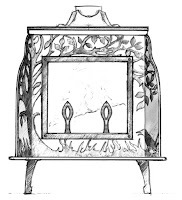 “This is a unique stove with a fun motif. 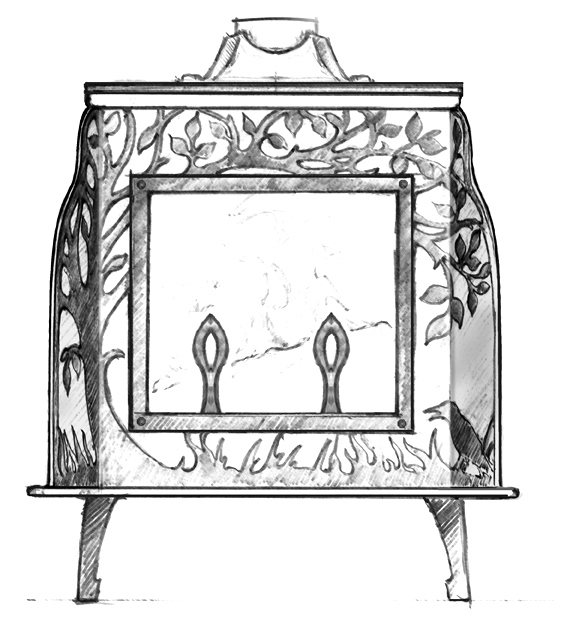 I can picture story time around the stove, with the stove as a focal point”. 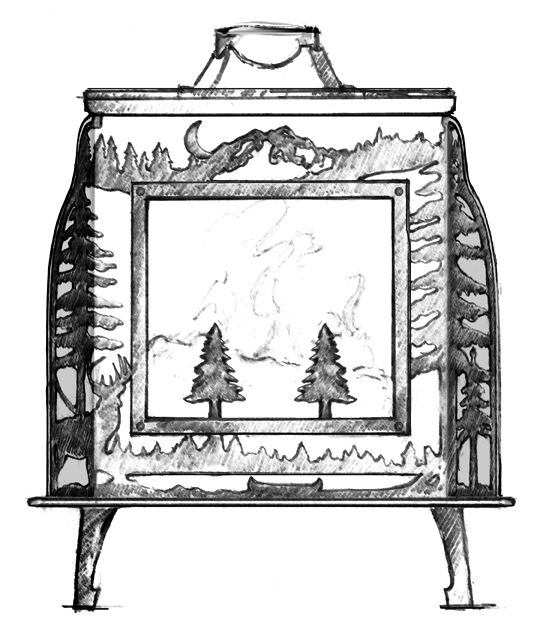 “A beautiful stove, inviting one in from a snowy cold day feel to it”. “I think this style has huge appeal all over the US – Midwest”! “Good design. Could also be used in arts and crafts home or cabin”. “My favorite, would look great on my hearth”. Again, we give a big thank you to everyone who participated in our survey. Your comments and suggestions have been read, considered, and we appreciate all of them. On Friday, January 22, 2016, we will be holding the drawing to see who will be the winner of our new Absolute Steel Hybrid stove. We will announce the winner that afternoon. In future blogs, we will discuss the large spectrum of opinions regarding the wings, designs and the overall aesthetics of our new Absolute Steel Hybrid stove.